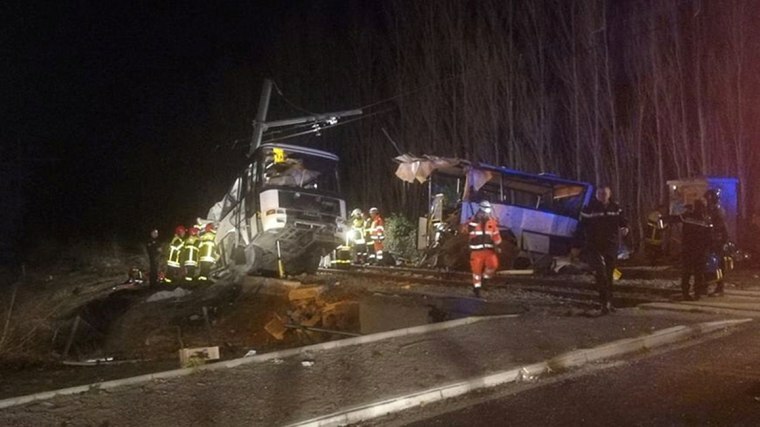 PARIS — A regional train hit a school bus on a crossing in southern France on Thursday, killing four children and critically injuring 11 other people on the bus, the French interior ministry said. Prime Minister Edouard Philippe, who flew to the scene Thursday night, said authorities still didn't know what led to the accident at the crossing in Millas, some 9 miles west of Perpignan, close to the border with Spain. Philippe said the "circumstances of this terrible drama are still undetermined." He confirmed that two inquiries were underway into the accident that left four children dead and 20 others injured — including 11 seriously. However, the head of the regional administration, Philippe Vignes, told reporters that investigators would examine whether everything worked properly and also look into reports that batteries in the automatic gate system had recently been stolen. He said seven of the injured and some of the dead had not been identified by late Thursday. Some 70 firefighters, 10 emergency ambulances and four helicopters responded to the crash. The school bus was transporting children home from the Christian Bourquin school in the village of Millas. It was carrying around 20 children aged between 11 and 15, the local authority said. Psychological help was being offered at a local sports hall from Friday morning. An SNCF official told The Associated Press that the train was carrying 25 people, including passengers and crew, and all were accounted for and being offered psychological care. The official added that that train normally travels at 50 mph at that location. "Several witnesses said the barrier was down" at the time of the crash, the official said. She said the people on the train were "totally shocked." Transport Minister Elisabeth Borne and Education Minister Jean-Michel Blanquer planned to speak to children at the school Friday. "France is in mourning," Blanquer said on Twitter.